To recount the complete Helmut Clasen motorcycling career story we could spend the entire evening relating it, and still not do it full justice! The same may be said of all Canadian Motorcycle Hall of Fame inductees, but this is particularly so when you are honouring a man whose career spans five decades and is still ongoing! Helmut Clasen’s two-wheel racing career began in his native Germany in 1948, at 13 years of age. It was not, however, on motorcycles but on bicycles–a road race, which he won! It set a pattern which Helmut would follow throughout his racing career. Between the years 1948 and 1955 Helmut would record more than 50 bicycle racing wins, and in 1956 qualify for the German Olympic bicycle speed racing team in Melbourne, Australia. The year 1956 also marked a dramatic change in his competitive direction with the acquisition of his first motorcycle, a 175 cc DKW. Helmut entered his first motorcycle competition events in 1957 in national and international off-road sport, motocross, enduro and trials events, winning gold, silver and bronze awards. In his motorcycling competition years in Germany, ranging from 1957 until 1968, the year he emigrated to Canada, Helmut would amass an amazing record of successes. These included 63 gold medals, 19 bronze and two silver. Among these would be his first gold in a German national championship, his first club championship, a second German championship, three class wins and three prestigious ADAC sport medallions (one each of gold, silver and bronze), one of Germany’s highest sporting honours. In 1962 he won his first gold in an International Six Days Trial, usually described as the Olympics of motorcycling. What is most notable is that he won this gold medal riding as a privateer, on his own machine, outperforming all the factory teams in the process! There was additional gratification for Helmut with this win. As mentioned before, he had qualified for the Melbourne Olympics in bicycle racing but had been denied the opportunity as a result of an industrial accident. A foot injury prevented his participation, not only in the Olympics but in any future bicycle racing. It resulted in his switch to motorcycles, and so this 1962 ISDT “Olympic” gold has a special personal significance for him. Helmut would later venture into auto rallies and enduros, again claiming victory. In 1968 Helmut made his new home in Canada, and one of his first orders of business was to join the CMA and Steel City Riders. He is by the way, a lifetime member of both organizations. In 1970 he rode in the first 24 hour road race at Harewood Acres, entered the Berkshire Two-Day in the U.S.A., winning gold, held the first ISDT school in Canada in Welland, Ont., became the first Ossa dealer in Canada, and created an Ossa 250cc ISDT bike which ultimately became a factory production bike in 1973 as the Ossa SDR. Helmut would win his second gold at the Berkshire Two-Day in 1971, incidentally, riding with a broken collarbone. Pain killers provided at each gas stop by his wife Hannelore enabled him to continue. His riding partners on that occasion were none other than Malcolm Smith and Steve McQueen, and Helmut has some interesting stories about that ride! In summing up his ISDT exploits, Helmut rode six in total, the Isle of Man in 1971, where he won the historic first ISDT gold medal for Canada, Czechoslovakia, Austria, Germany, and the U.S. on two occasions. He went as a volunteer twice, once in Spain and the other in France, with the honour of being the flag carrier for Canada. Helmut added two more medals to his ISDT collection, a silver in Austria in 1976, and a bronze in Germany in 1989. Incidentally, he was the oldest competitor in that event. The next few decades would see Helmut to continue to amass an enviable record of victories in various off-road events. From 1983 through to 1996 he would win no less than 13 six-hour motocrosses, with an additional one as a team rider in 1997. He would compete in no less than 14 Corduroy Enduros (including the most recent one in September of this year with a class win), finishing no less than 13 of them. Those that know the challenge of the historic two-day Corduroy Enduro, now in its 54th year, will appreciate the significance of this achievement. 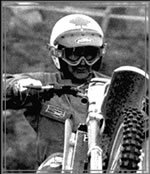 In 1978, he claimed the CMA 125 cc national enduro championship. Helmut would capture Ontario CMA championship class titles in hare scrambles in 1990, ’91, ’92, ’97, ’98, and 2000. And the national CMA championship class titles in hare scrambles in 1990, ’97, and ’98. Much to his credit, many of these were realized later in his career in the vintage and super vintage divisions. Helmut is also the recipient of many other achievement awards. In 1972 he was an honoured guest at premier Bill Davis’ gala dinner for sport achievement. He has been awarded several rider of the year recognition awards from the Steel City Riders Club, now in its 60th year. One award that has special significance for Helmut is the Al Eames award presented to him at a Six Day riders reunion in the U.S. This was presented in recognition of his extended participation in international competition representing Canada, and for promoting the sport. Helmut sponsored European riders to compete in Canada and the U.S. on more than one occasion. He also was presented with the Canadian ambassador award in 1972. In addition to being the first Ossa dealer in Canada, he was also the first Canadian dealer for the Zundapp and Hercules brands, and was the Canadian importer for KTM for four years. Taking inventory of the estimated 1,500 medals, trophies, plaques and diplomas that Helmut has amassed throughout his five decades of competition would present a formidable task. He is a true Canadian champion and tremendous ambassador for motorcycling and for Canada.